In the Garden of the Waxhaws, history has returned! 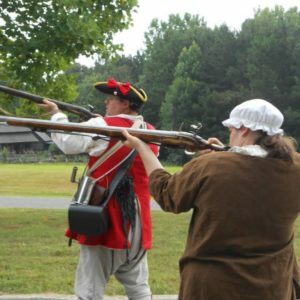 The culture of the Scots-Irish settlers, who courageously forged a new civilization in the Carolina backcountry, is now remembered in this lasting memorial with exhibits inside and outside on our grounds. The Museum of the Waxhaws documents events that took place in this region from 1650 – 1900 with permanent and temporary exhibits for you to see. – Visit us and allow history to come to life before your eyes! –Tour a preserved Early American homestead and walk the paths where Native Americans once hunted for food. 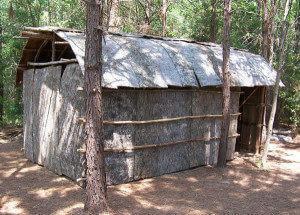 See replicas of the dwellings built by the Waxhaw Indians. Experience panning for gold and savor the aroma of our herb garden. –Hear a story or maybe a song from days gone by. Enjoy our region’s history, brought to life at the Museum of the Waxhaws. Field trips are ideal for children as young as six or seven years old through upper grades. We can accommodate any group of children or adults of all ages at our indoor and outdoor exhibits. Book your field trip for students or group visit today! Your special requests and suggestions are welcome here. We are always improving our exhibits as they are maintained. We are constantly building upon the presentations we make to showcase our exhibits. At the Museum of the Waxhaws, history is presented to you in a living, reenacted format, or through realistic exhibits featuring actual artifacts, architecture, and photographs. When you arrive at the museum campus, you will enter the Garden of the Waxhaws as it was called when the earliest European settlers started a new life for themselves. Come and experience life as it was for these brave settlers and the Native Americans who first dwelled on this land.